Drink your fruits, vegetables, and vitamins all in one convenient shake! 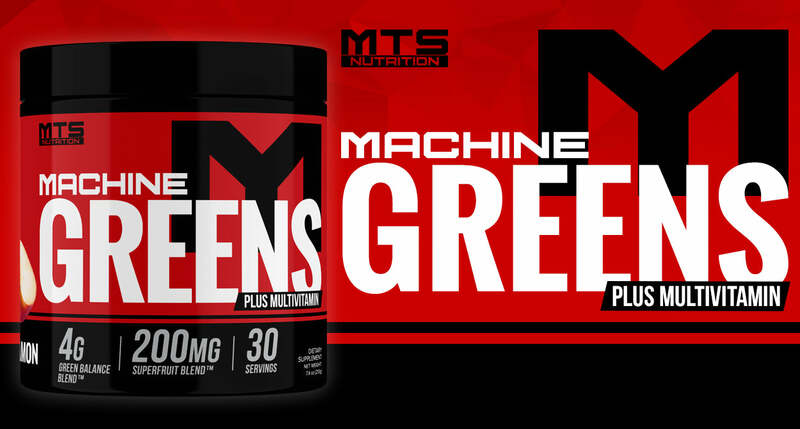 Machine Greens™ is the first of its kind offering not only the most complete HEALTH AND WELLNESS blend on the market, but a full offering of healthy ALL NATURAL INGREDIENTS! A synergistic "green" formula of concentrated alkaline superfoods. A valuable source of naturally occurring phytonutrients, chlorophyll, live enzymes and bioavailable vitamins and minerals, Green Balance™ Alkalizing Blend aims to help boost energy and stamina, assist with mineral replenishment and provide optimal support for the body's systems. Active Ingredients: Phytonutrients, chlorophyll, enzymes, vitamins, minerals. A delicious proprietary blend of the world's most phytonutrient-rich Berry Superstars including Acai, Maqui, Jabuticaba, Acerola and Raspberry. Bursting with a potent variety of vitamins, minerals, carotenes, protein and omega 3 fatty acids, BettaBerries™ Blend is a super concentrated whole food source of polyphenols, anthocyanins, xanthones, resveratrol and carotenes and offers whole body antioxidant support. Active Ingredients: Polyphenols, Anthocyanins, Bioflavonoids, Carotenes, Resveratrol. A unique spore forming bacterium, perhaps the most effective, stable and potent probiotic strains available. It is a remarkably resilient strain of probiotic bacteria; strong enough to withstand processing and even stomach acid, yet bioavailable for the work it is meant to do. ProDURA™ is a spore forming bacterium with a protective coating that stays dormant until it meets the perfect conditions of heat, pH, and moisture found in the large intestine. Unlike many cultures, it can survive extreme processing, shipping, storage as well as the natural challenges of the digestive tract. It is naturally found in fermented dairy and vegetable products. It has been shown to displace pathogenic bacteria and create an acidic environment in the intestines. L. plantarum also synthesizes L-lysine, an amino acid that promotes the absorption of calcium and the building of muscle tissue. It also plays a role in the secretion of the naturally occurring antibiotic Lactolin and has shown to encourage anti-viral activities. It has been shown to help with chronic bowel conditions including ulcerative colitis and IBS. It has shown to inhibit pathogenic bacteria such as Salmonella and E.coli. It also assists with better digestion and utilization of the food we eat. Additionally it removes plaque from teeth. You will also find that not only do we have all of the above, but a COMPLETE, premium multi-vitamin built in. So you get all of the benefits of the SUPER HEALTH elements PLUS a complete multivitamin all for about the same price as the multivitamin alone from any other company. This plus the quality assurance of Marc “The Machine” Lobliner’s MTS Nutrition, and you have a MUST-HAVE ALL IN ONE HEALTH SUPPLEMENT that your body needs!